Olsen Chain & Cable wire rope and cable slings allow you to safely lift even the most difficult loads. Cable and wire rope slings are manufactured with various grades of wire rope with different rope lays (the direction the wires and strands are twisted). Olsen Chain & Cable also manufactures Independent Wire Rope Core (IWRC) or fiber core. Wire rope slings are manufactured with various grades of wire rope using different rope lays (the direction the wires and strands are twisted). Olsen Chain & Cable wire rope slings are strong, bend without distortion, safely grip and lift even hot materials and are built to handle abrasive wear. We produce various types, including Independent Wire Rope Core (IWRC) or fiber core. If fiber core wire rope slings are exposed to temperatures above 180° F (82° C), retire these slings. For metallic core wire rope slings of any grade, follow manufacturer’s recommendations on use at temperatures above 400° F (204° C) or below minus 40° F (minus 40° C). Most wire rope slings are made of Independent Wire Rope Core (IWRC) or fiber core. Fiber core is a bit more flexible but less resistant to environmental damage. Wire rope core has great strength and is more resistant to heat damage. Properly match components. Ensure that the fitting is the right shape and size so it accurately seats in the hook or lifting device. For multiple-leg slings used with nonsymmetrical loads, have a qualified person do an analysis so you don’t overload any leg. Select multiple-leg slings according to OSHA guidelines for wire rope slings. OSHA rates loads based on material strength, design factor, type of hitch, angle of loading, diameter of curvature over which the sling is used and fabrication efficiency. Never exceed the working load limit and avoid shock loads. Refer to OSHA guidelines for wire rope sling rated loads. Do not use wire rope slings with loads above the rated load capacities on the tag. Store slings away from potential mechanical or chemical damage, sunlight, ultraviolet light and extreme temperatures. Properly hitch slings, pad sharp edges, balance loads, don’t drag slings, keep them free of knots or twists and don’t pull a sling from under a load when the load is on the sling. 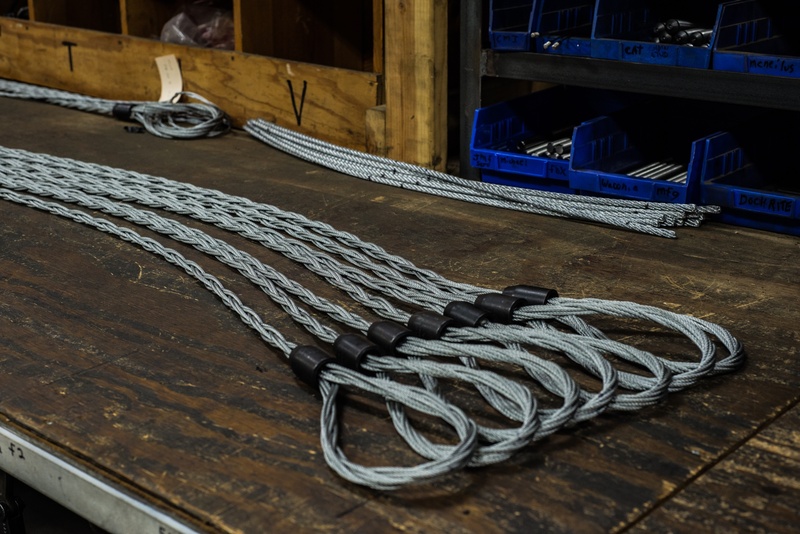 Have each person who will use your wire rope sling know and follow its type of load, hitch and rated load capacity. Contact us for clarification. Follow other safe operation procedures, including selecting the right sling, keeping people safe distances away from the sling and its load during movement, properly rigging loads and inspecting all slings daily and according to OSHA-approved ASME guidelines.